This has always been a piece about Garry Marshall’s Falcon Theatre in Burbank becoming – with the passing of Mr Marshall – the Garry Marshall Theatre. And I will get back to the important changes going on there, but Garry Marshall was also very much a creature of show business – stage, film and especially TV – so let’s take a dip in those waters before circling back to the legacy of the one and only Mr Garry M.
It’s almost 35 years since Neil Postman’s book Amusing Ourselves To Death was published. The book couldn’t be more topical, as we are awash in “dystopian societies” as soures of entertainment, and that was Postman’s Topic A. It was 1984 at the time, and everyone had George Orwell (author of 1984) on their minds – fear of Big Brother and the onset of the totalitarian state. But Postman posited that the dystopian model we were heading towards wasn’t the one in Orwell’s novel but rather the one to be found in Aldous Huxley’s Brave New World. In Huxley’s dystopia, the population all becomes addicted to a pleasure-inducing drug called soma, whch causes them to exchange their interest in rational thought and public discourse for an obsession with televised entertainment. Sound familiar? Certainly thoughts of both Huxley’s and Postman’s books were stirred up by THE 69th PRIMETIME EMMY AWARDS, which host Stephen Colbert described as “us celebrating us.” This is something that Hollywood is justly famous for, which, again, Colbert deftly characterized as “clapping our hands while patting ourselves on the back.” I’ve already read some accounts panning Stephen Colbert as a host, but I don’t agree – those opening musical numbers are intentionally silly, and his sophisticated sense of humor was surely an upgrade on James Corden, who bores me to tears, or whoever else hosted it last year. No, the sad part was seeing someone as witty and intelligent as Colbert having to be dumbed down so he could play to the lowest common denominator, which probably still wasn’t dumb enough for the advertisers… though I could almost hear them sighing out loud that at least he wasn’t Jewish or black. And yes, it was good to see some well-produced shows rewarded, and to have more women and African-American winners than in recent memory. White American men, especially of the hetero variety, were definitely the big losers, though British hetero men (John Oliver and that guy who wrote Black Mirror) did very nicely, thank you very much. Of course Latinos and Asian-Americans of all kinds were largely left out, which oddly seems to arouse little attention or concern. My guess is, though, if you follow the money trail, it would still lead largely to white men. For those who think there’s been a major power shift going on, get real. That’s the very meaning of “soma,” which provides a pleasant fantasy-high while the old sleight of hand is taking place. Now I was going to use this as a transition point into talking about two of the more amusing series on TV right now, EPISODES (Showtime) and GET SHORTY (Epix), both of which find the source of their humor in the deeply anxiety-ridden and often-perilous world of show business. Both take place deep inside the Hollywood bubble, where the power plays for fame and fortune are going on. Anyway, I recommend both shows highly and am happy to say that Episodes has come back stronger than ever from its premature death (yes, it was cancelled in 2016) and is, for my money, the funniest show on TV. But I’ll have to save that discussion for another day, as the spirit of Garry Marshall has begun barking at me in that inimitable Brooklyn accent, telling me that it’s time to circle back already, if I know what’s good for me. So yes, back to my own Topic A: what has been The Falcon Theatre in Burbank for the last 20 years has now become The Garry Marshall Theatre. This may seem odd at first, since Garry Marshall was known mostly for commercial film blockbusters like Pretty Woman and The Princess Diaries, and for TV shows like The Odd Couple and Happy Days (and its various spinoffs). But the Falcon was a passion project for Garry, who participated in every aspect of its creation, then ran it with his daughter Katherine Marshall LaGambina in a very hands-on way. I saw many shows there over the years, and Garry was often in the lobby, especially for the first 10-15 years, greeting the audience as if welcoming them into his home. Sometimes – especially on matinee days – Garry could be found napping on a chair in the lobby. When roused, he would smile and go right into a conversation, as if he’d just been conversing with you a moment before. 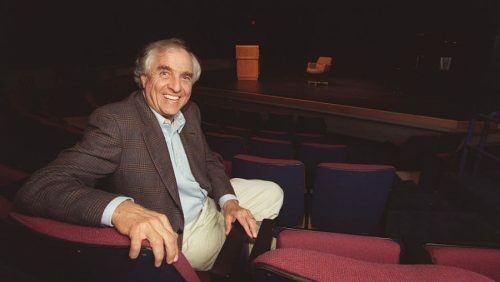 The 130 seat Equity house will now become the non-profit Garry Marshall Theatre under the leadership of co-artistic directors Joseph Leo Bwarie and Dimitri Toscas. As Joe Bwarie explained to me, the theatre will now be developing a subscriber base, like the Geffen and the Center Theatre Group. For the first season, the plan is to present four plays, all by Pulitzer-Prize winners and all with some connection to Garry Marshall. First up is MASTER CLASS by Terrence McNally, directed by Mr Toscas and starring Carolyn Hennesy as the great opera diva Maria Callas. That begins performances this week (Sept. 20) and will run until Oct. 22. You can click here for further information and tickets. 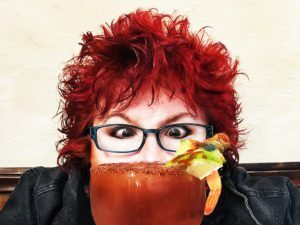 This will be followed by A FUNNY THING HAPPENED ON THE WAY TO THE FORUM with music and lyrics by Stephen Sondheim, the West Coast premiere of THE OCCUPANT by Edward Albee (about the sculptor Louise Nevelson), and LAUGHTER ON THE 23rd FLOOR by Neil Simon. Here’s hoping they can do Garry proud and bring his distinctive touch to the work – which means being something more than just “us celebrating us.” But I’ll let co-Artistic Director Dimitri Toscas speak for himself on this point. Take it away, Dimitri. Garry believed that gathering people together to share a live storytelling experience was one of the most important ways we process our lives together. He loved live television. He loved live theatre. And to honor that lifetime dedication, our mission is to continue to bring people together for the unparalleled experience of participating in the live arts. We will continue to strive to connect people through diverse storytelling and innovative performances, and echo and expand upon the philosophy that the live arts spark ideas, elicit conversations and pledge the promise of possibility. Our hope is that we can open the theatre up to be a community stomping ground for exploration and education as we celebrate and cultivate artists and audiences alike, and we’re working toward programming, classes, and other opportunities that can support these big, abstract ideas. That’s a tall order, we know…but we want to prove we are up for the challenge. We are also excited to carry on Garry’s tradition of looking for new works and developing new pieces to produce in the future. To do that, we will be hosting a New Play Festival in the Spring. This will give us a chance to review new works that will be submitted by both new and established playwrights. After the preliminary review process, we will present the selected new plays in a series of readings that the audience will be able to give us feedback on. Hopefully we will find new works to develop into full productions in future seasons here at the Garry Marshall Theatre and beyond. 2017 marks the 20th Anniversary of Garry Marshall’s Falcon Theatre in Burbank, where there has been a subscription season for the past 15 years. For the past twenty years, the theatre was a for-profit company that was subsidized by Garry himself, but now, to keep the theatre thriving and growing into the future, we are in the process of transitioning to a nonprofit company, putting the new theatre more in line with the industry standard for successful regional houses across the country. Now, as a new nonprofit theatre, we are reaching out more to the community, sharing our story with a wider audience, because we can only survive with the continued support of our subscribers and the Toluca Lake, Burbank, and Los Angeles community at large. For the first time, we have a Board of Directors, Joe and I have been named Artistic Directors to maintain and develop the artistic vision of the theatre’s growth and expansion, and Sherry Greczmiel has been named the Executive Director. Together, we are developing the programming, productions and procedures that will hopefully grow the theatre into the next twenty years. An important way we are reaching out into the community is by including other successful theatre companies in our programming. Personally, I don’t think I’ve ever looked at other artists, directors or companies as “competition” when it comes to theatre. Art is collaboration. Not competition. And to be true to that, we are opening our doors and welcoming successful companies and artists to collaborate with us every season here at the new Garry Marshall Theatre. This year, we are welcoming Rogue Artists Ensemble to our stage in the Summer of 2018 with their multi-media production of WOOD BOY DOG FISH, a macabre retelling of the Pinocchio story. It’s a dark, arousing curiosity written by the remarkable up-and-coming playwright Chelsea Sutton, with original music by Adrien Prévost, directed by Sean T. Cawelti. Besides this Hot Summer Show, we will also host other companies throughout the season, with special events and concerts — all in an effort to reach out into the community and welcome more people to make ART with us for our Inaugural Season. November 30, 2017 LA STAGE: A Royal Dilemma and Lots of (Crazy) Comedy Tonite!